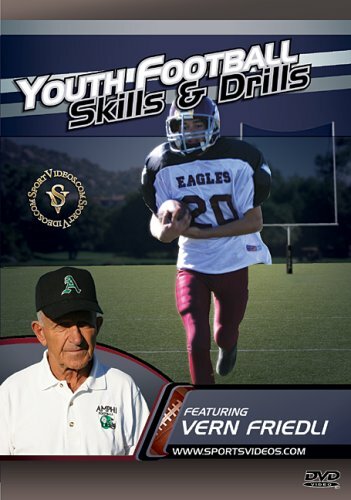 Coach Vern Friedli presents a comprehensive program designed to benefit anyone involved in youth football. The DVD is designed to develop the essential fundamentals that young players need to be successful. Among the topics covered are: stances, important techniques required to play various positions, pass patterns, blocking, tackling, and numerous drills at every position. The Special Features section covers special teams skills and drills, a speed and endurance workout, and additional tips for coaches, parents and players. About the Coach: Vern Friedli has been a high school football coach for over 40 years. Currently, he is the head football coach at Amphitheater High School in Tucson, AZ. He is one of the few coaches in the United States who has won over 300 games in his career. He has led Amphi to the State Playoffs 25 times in the past 30 years, with one State Championship and 4 State Finals. Several of his players have played football at the college and professional levels.